Abhichandra (meaning 'beautiful moon') is an extraordinarily radiant 8 foot albino Colombian Red Tail boa. He has a gentle nature and has blessed many with his lovely, soothing slither. 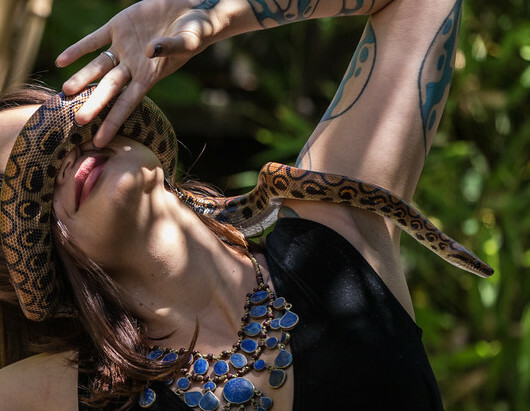 Abhichandra's elegance and grace shine like the beaming moon when he dances with his Serpent Mama, Shannon Lorraine, and with other serpent sisters. Abhichandra intrigues people wherever he goes and his power is seen at first glance by those drawn to his healing beauty. He is always inclined to spread his infinite and deep devotion and affection to those that are ready to receive his gifts. 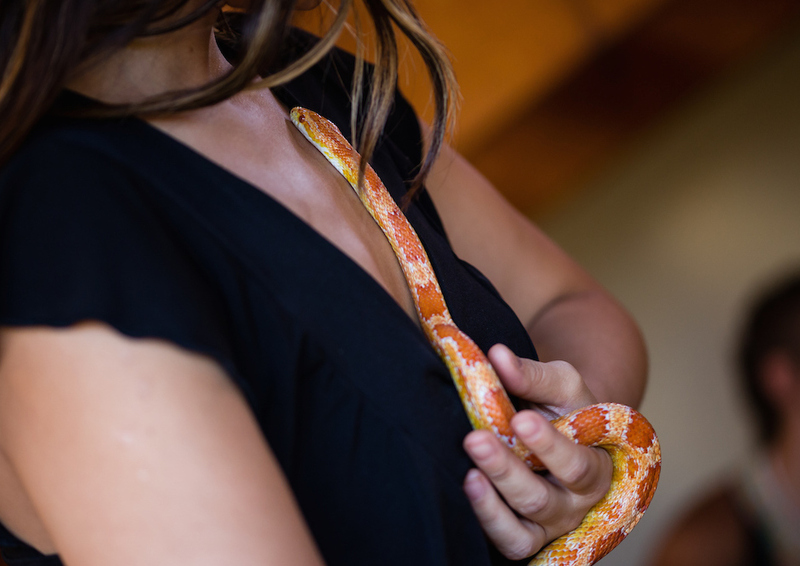 Agni (‘divine fire’ in Sanskrit) is a 5 year old Okeetee Corn Snake with a fiery personality and a deep connection to Nature’s spiraling cycles. He arrived ecstatically into the Sanctum on the full moon, joyfully sharing his freedom and sacred serpent medicine with many who had never held a serpent before. Like the red sandalwood of his skin, Agni invokes the sweet spark of divine knowledge to guide those he encounters towards their own divine Fire. 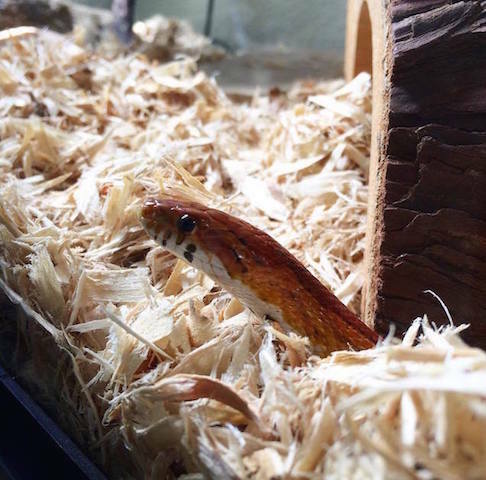 Alma is a heavenly hypomelanistic corn snake who has been with the Sanctum since 2012. She's a sweet and sensitive little healer who snuggles up close to everybody she meets. If you let her, Alma will caress your skin and even squiggle inside your clothes—she is a potent kundalini activator, and especially loves to tickle where the sun don't shine! Alma has helped many people loosen up and enjoy their playful spirits. She has had 2 different sized eyes since birth, a sign of her visionary powers. Alma often visits her admirers in dreams to inspire new wisdom and transformation. 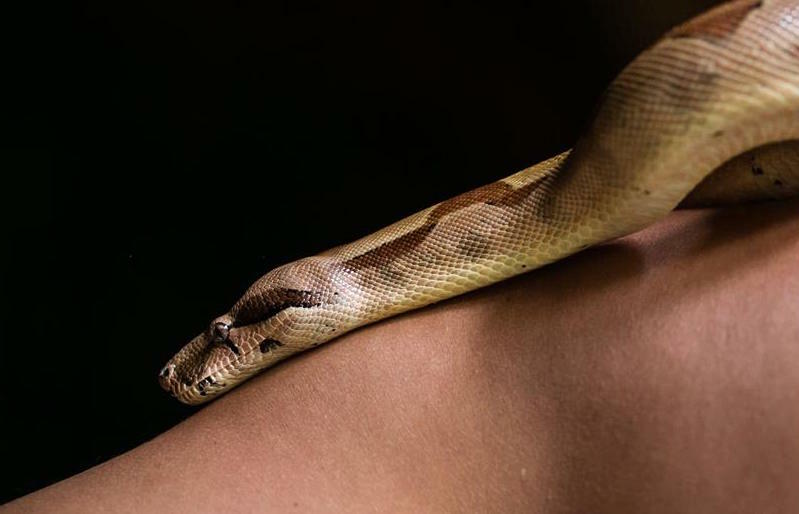 Damiana is a 6 foot Colombian Red Tail Boa who found her way to the Serpent Sanctum in 2015, leaving behind a life of urban isolation and neglect. Although when she first arrived to the Sanctum Damiana was depleted and weak, she has blossomed beautifully among the joys of sisterhood and dance and loves cuddling up to her many admirers. Damiana’s healing powers are profound, and she seeks out and uses her sensitivity especially with those whose suffering is intense, soothing all souls with her gentle embrace. Nataraj (meaning King of Dance) is a handsome 3 year old Brazilian Rainbow Boa with a gentle spirit infused with presence, humility & grace. He arrived on a new moon in 2018 at the height of a Serpent's Path retreat, where he initiated all in attendance into Rainbow Serpent medicine. Nataraj embodies a beautiful energy of radiant awakening—as his shining rainbow iridescence gently twines around his dance partners, he takes them deep into the mysteries of the Serpent. He is a tender soul who loves a sensual bath and massage every moon when he is ready to shed his skin. Nataraj has slithered his way into the heart of the Sanctum for good! Born into the Sanctum on Día de los Muertos in 2017, Osiris is a super pastel baby Royal Python who lives up to his otherworldly name in more ways than one! Like the mythological god cast into the Underworld and reborn in the hands of the goddess Isis, Osiris was one of twin serpents sharing a single eggshell at birth, and had to be helped out of the egg and into life by his serpent mama Rose Mary in the middle of the night. Although he started off small, Osiris is healthy and growing into a kingly serpent. He is a sweet and loving snake who likes to nestle into human breasts and enjoy the rhythm and warmth of the heartbeat. Risa is a mystical pastel Royal Python with a mysterious past. Because she wasn't handled much by her previous caretakers, Risa can be shy at first—but once she warms up to you, Risa is a fabulous dancer and loves to crown like the queen she is! Risa is quite curious and enjoys exploring the many paths and people she meets through her work with Serpent Sanctum. 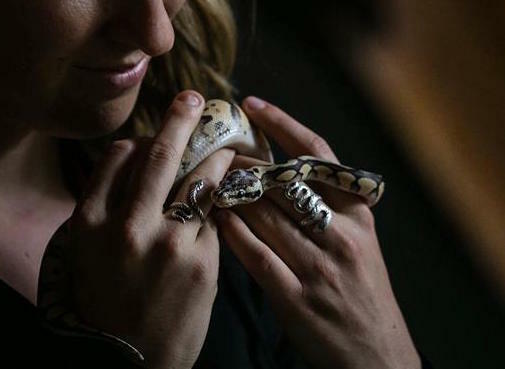 She's a powerful hunter with strong instincts and a deep medicine of truth-seeking—and recently became a mother to 4 beautiful slithering babies. Risa's sweet spirit invites each person she meets to smile and laugh with her on the road of life! 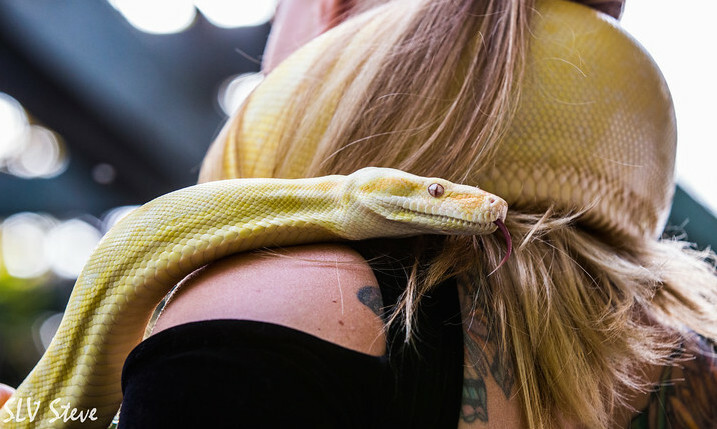 Shiva is a 9 year old pastel royal python who has been dancing with Serpent Sanctum since 2012. He's the life of the party, a total charmer who loves meeting new people. Shiva loves other snakes and enjoys spending time with his slithery friends. He has fathered 12 little wiggly babies (mostly pastels like himself), and has blessed the Sanctum with 2 magical super pastel babies. He is pictured here snuggling with his latest sweetheart Risa and their serpent mama Rose (he's the one licking mama's shoulder). Tiamat is a queenly pink Salmon Colombian Red Tail Boa, born to Serpent Sanctum in May 2016. She is the keeper of a profound shamanic wisdom, revealed in her first days of life carrying her placenta outside her body. Tiamat's persuasive peach-pink hugs have melted many hearts, blessing those she meets with pleasure & beauty. Yet she loves best to shine as the Queen's crown, caressing the third eye with her sweetness. She and her twin sister Vida also carry a powerful karmic medicine that integrates old energies into beautiful new connection. They have been raised together throughout their lives. 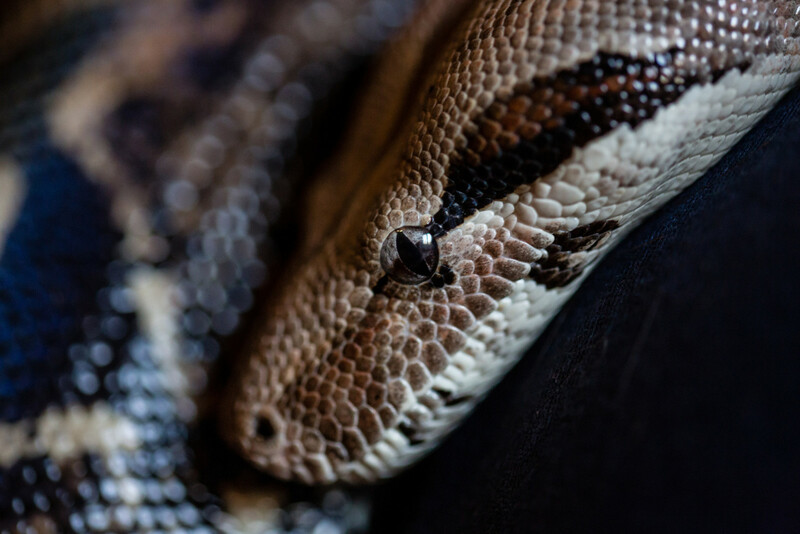 Vida is a gorgeous Salmon Colombian Red Tail Boa, born to the Sanctum in May 2016 with her twin sister Tiamat. Adorned with radiant caramel skin, she loves to lounge in the sun where her rainbow iridescence is revealed. Her vibrant spirit inspires respect and admiration wherever she goes—all who meet her are starstruck by her power, grace, and strength. Vida enjoys climbing and will quickly find her way to the top of any tree. She also enjoys dancing and will wrap her generous coils around as many dancers as she can reach. With every sinuous movement of her serpentine body, Vida declares that she was born to live life to the fullest!